The National Academy is releasing a PNAS paper on the carbon cycle by Canadell et al. to the public. A summary is available on Environmental Research Web. The news is grim. The carbon intensity of the global economy has stopped improving and the efficiency of the ocean sink is declining. Consequently CO2 accumulation has not only continued but has accelerated over the past six years. the IPCC's most pessimistic emissions scenario! Here are the ones I found most outstanding. The first one should warm the heart of any accountant; it's a budget. An important point to note from the first image is that emissions are increasing and the ocean is not keeping up; while its total absorption of carbon is roughly constant, its fractional contribution is clearly declining. That means a larger proportion of our emissions contribute to climate change. 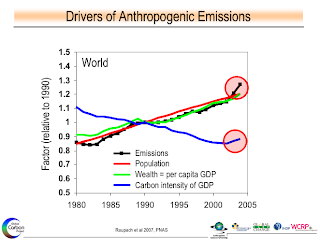 Total emissions can be seen as the product of three terms: population, per capita wealth, and carbon intensity. Until very recently the carbon intensity was balancing one of the other two, but now it is trending the wrong way. This is an economic way of parsing out the recent deterioration in the carbon situation. According to this analysis, we don't have more growth than usual. It is just much dirtier growth than usual. Here's the punchline. It is starting to look like the IPCC scenario spread is far too optimistic. * 18 % (+/- 15) pour la diminution de l'efficacité des puits naturels. Enfin, last but not least, les auteurs indiquent que les modèles couplés climat/cycle du carbone (couplage qui n'est pas inclus dans les modèles du GIEC, au passage...) indiquent bien un affaiblissement des puits pour le 21ème siècle (causant une augmention supplémentaire de 20 à 200ppm de CO2 atmo d'ici 2100 par rapport aux scenarios IPCC, voir Friedlingstein et al. 2006 ), mais pas pour la période 1959-2006: pour cette période ils indiquent plutôt une baisse de l'Airborne Fraction (i-e, des puits plus forts). Ceci suggèrerait d'après eux que les feedbacks carbone/climat se produisent plus rapidement que notre compréhension des phénomènes gouvernant l'absorption des puits ne le laissait penser. There's an mp3 of an excellent CBC interview (Quirks and Quarks) of one of the authors, Chris Field; you'll have to put up with some introductory sound effects and promotional bluster. Anybody else care to point to this? I think it's about as important as it gets. Wow. Thank you. And very Tufte-esque presentation. Most of the credit goes to Canadell of course, not to me. This looks to me like a very big story which is still under-reported and underblogged. OK, somewhat Devils-advocate-y, I'm going to disagree with you. Sorry to keep pushing the same old thing, but look at http://scienceblogs.com/stoat/2007/10/airbourne_fraction.php and its pics. CO2 in the atmos growth is still about 0.5%/y averaged over the last 10 years. CO2 is below the SRES line, not above it. CO2 emissions growth is worrying, but its not the thing that matters. The high price of oil is going to push people towards coal, as is Chinas use, so I guess that intensity may well keep going up. William, I really don't get it. I'm not sure what, exactly, you are diabolically advocating. Coverage is focusing on what is in the long view a non-central point in Canadell. Your response is to focus on that same point. The "thing that matters", I suppose, is the composition of the atmosphere, not the emissions rate. True, but that is tightly coupled to emissions, isn't it? Atmospheric CO2 growth is noisy on interannual time scales, atmosphere + land is not. Focusing on the former is not the clearest way to look at the situation. The growth of emissions far beyond expectations would seem to me to be a big deal, though. It is added to the fast reservoirs. Biosphere response is complex and ill-understood but the main point is that all the extra carbon sticks around for a long time. Specifically, emissions growth amounts to a positive second derivative (growth rate fo the growth rate) of the carbon in the fast reservoirs. That can't possibly be good news even if its hard to make out in the cumulative CO2 curve as yet. China (and presumably Chinese coal) is indeed the crucial component here as the Raupach paper shows. Whether this is entirely China's doing or whether the rest of us are happily colluding in exporting our misbehavior is an interesting moral question about which the radiative balance of the atmosphere cares nothing. Canadell's approach is the right way to present the problem to people who don't understand the niceties. I understand you don't want to exaggerate but sometimes I think you are trying to overcompensate for excesses you perceive by insisting on the least alarming way to present information. There's a recipe for disaster if ever I saw one. As you say, "CO2 emissions growth is worrying". Yes, it is. As Stan Lee might say, "'nuff said". 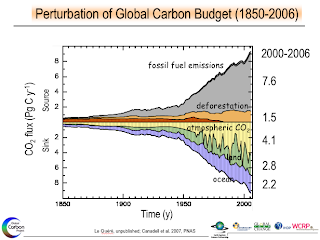 The misfortune is that this carbon cycle is being interpreted as totally apocalyptic, therefore more people are becoming fatalistic and tuning out the need to take action, instead of being empowered and driven to take the bull by the horns now. I would suggest that anyone who points to this paper frames the situation as one that requires all hands on deck! Inel, another possible misfortune is that people may mistake all of the encouraging talk that has happened of late for actual progress. Admittedly, some corners of the fossil fuel interests may be so completely senseless and morally bankrupt that they actually encourage the sort of fatalism you describe. Fortunately that approach is not as attractive as "nothing is happening". Note that a common denialist pitch is that "something big is happening and it's not our fault". At this point that's so obviously wrong that I wonder how they sleep at night. It's also obviously enough wrong that it won't matter. So I think sweeping symbolic gestures with no actual progress attached is (which is what Kyoto turned out to be, after all) is the bigger risk. We certainly need to be aware of both dangers. The growth in emissions would certainly be worrying, if you thought it was going to continue. But will it? If we wildly ascribe this to Chinese coal, then the answer is "unlikely", because they are choking on pollution now and will start dying in large numbers if the growth continues. I hope your prediction that the totally unanticipated emissions growth is in some way self-limiting pans out, though I would hate to express enthusiasm for your proposed mechanism. I don't see your proposed constraint or any other existing constraint being sufficiently effective in turning the tide against the increasingly mindless economic frenzy that envelopes all of us. After all, we certainly aren't yet to the territory of worst case emissions rates. There is plenty of coal. It isn't the CO2 part of the coal emissions the Chinese are choking on, but particulates which can be removed by known methods. 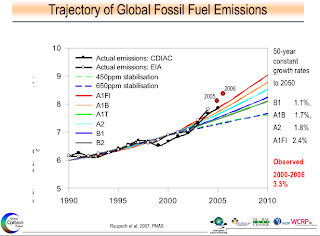 Existing systems and strategies don't seem up to the task of limiting the emissions trajectory. Even if the Chinese start exercising some restraint, they have paved an unfortunate path for others to follow. The idea that this won't show up in the total concentrations fairly soon can only be predicated on the idea that the emissions numbers in Canadell are wrong. If you concede these emissions numbers are right, the overall problem has gotten that much worse, in spite of all the noble talk and Nobel prizes. The Chinese could just install some filters / upgrade technology, reducing the near effects of coal plants (which would be good for the environment too!). The CO2 emissions would still be the same. I agree with your last, mt. I've been reading (several times through, so far) Geological Carbon Sinks by Andy Ridgwell and Ursula Edwards (chapter 6 of a book that's too rich for my budget)and I notice two things. First, lifetime considerations (for CO2, CaCO3, etc.) are based on continuing current situations unchanged. Second, several of the natural carbon removal processes described, such as dissolving of CaCO3 in cold sub-polar water or erosional deposition of Ca++ (and Mg++) ions into sea water could potentially be sped up by many orders of magnitude by human action (GeoEngineering). I expect you are opposed to such actions on the basis that fixing one perturbation by making another just adds to the risk, but it seems likely to me that with 20 or 30 more years of research, we may know enough to intervene and succeed in getting the desired effect. Am I missing something here? BTW, I notice that one of the authors of the linked paper has oil company affiliations. Should I be suspicious here, or is this book (and therefore its chapters) as solid as it seems? AK, I'm not much of a geochemist. Why don't you tell me what the chapter says? I have no fundamental objection to science done by scientists with fossil fuel industry affiliations, and I have no fundamental problem with the sort of geoengineering that removes carbon from the system. However, if you mess with ocean geochemistry, you will need to make a case that you aren't damaging the ocean to save the atmosphere. Most people would like to have both continue to exist in some semblance of their natural state. It is too late to think about a gentle return to preindustrial equilibrium. That is simply out of the question for many centuries. We have taken the wheel of this thing and we'd damn well better learn to drive it. Unfortunately, the science, daunting though it may be, seems like the least of our problems. OK, although I'm about as much of a geochemist as climate scientist (i.e. an amateur knowing just enough to be dangerous; by profession I'm a computer programmer/systems analyst). Their description of the calcium carbonate seems to involve a long cycle balanced by the dissolving of precipitated CaCO3 by cold bottom water under the increased CO2 pressure. "Each mole of CaCO3 that dissolves removes one mole of CO2(aq) to form two moles of bicarbonate [...] Thus, water masses that have passed over carbonate-rich sediments become, in a sense, ‘recharged’, and are able to absorb more CO2 from the atmosphere (Fig. 6.7a). One can think of this as anthropogenic CO2 being ‘neutralized’ by the reaction with sedimentary CaCO3. We will refer to this carbon sequestration process as the ‘sea-floor CaCO3 neutralization’ sink. It should be carefully considered that although the dissolution of sedimentary CaCO3 results in an increase in the total amount of carbon dissolved in the ocean, the proportion of dissolved inorganic carbon (DIC) that is in the form of CO2(aq) actually decreases (compare dotted and dashed lines in Fig. 6.8c) as a result of reaction with CaCO3. It is the associated reduction in ambient pCO2 that allows further transfer of CO2 from the atmosphere to the ocean." Since this depends primarily (AFAIK) on near contact with bottom sediments, it operates on a long time cycle. Introducing finely powdered CaCO3 into the cold surface waters might therefore cause the dissolution of a roughly equivalent mass (~1/2-3/5) of CO2. This is just an amateur guess, and I'm unsure why the possibility isn't covered in the chapter, but it's the sort of thing that, IMO, should be studied unless there's a clear reason (to experts) why it wouldn't work. In their model run, "At year 40,000, the concentration of CO2 in the atmosphere is 435 ppm, which equates to an atmospheric inventory of 951 Gt C. Thus, terrestrial CaCO3 neutralization has removed 15% of the original 4167 Gt C burn (in addition to the initial ocean invasion and erosion of CaCO3 in deep-sea sediments). Just 344 Gt C (8%) of anthropogenic CO2 is then left in the atmosphere – a finding that is consistent with previous estimates (with a range of 7.4–7.9%, depending on the magnitude of the assumed fossil fuel burn (Archer et al., 1998))." It seems to me a similar result, for the much smaller burn currently in effect, could be achieved in a few years. A similar logic applies to silicate weathering, involving a natural settling time (my term) of hundreds of thousands of years, which might be shortened to decades through artificial erosion of selected rocks (presumably basalts) and deposition of the result in cold sub-polar ocean water. As I mentioned, I'm no expert on the subject, but if Canadell et al have picked up the beginning of a positive feedback switching to a new meta-stable state (or new attractor), then there may be some urgency about this sort of thing.